Your information has successfully been submitted. We'll be in touch shortly. Thanks! Thank your for your interest in CartRocket. 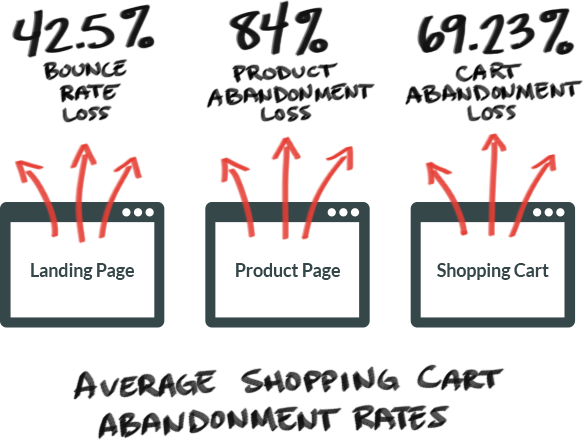 If you want more sales, Stop letting 70% of your customers abandon their shopping carts. Do you know how much money you're losing every day from Cart Abandonment? Traditional shopping carts are not built for customer retention. Every single day on your website, over 2/3rds of your visitors are completely abandoning their purchases and never coming back. These aren't just visitors that bounce. These are customers with actual products in their shopping carts ready to buy, who then leave! As an online merchant, you need an effective way to get more of these abandoning customers to stay and complete their purchase. You need Cart Rocket. 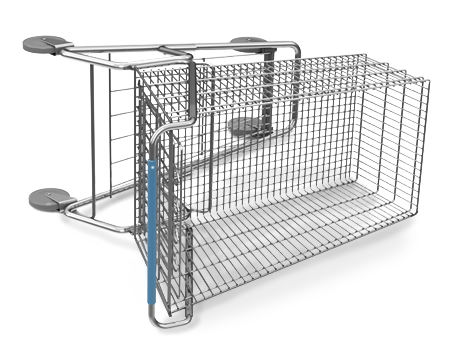 is the most effective Cart Abandonment Solution ever created. shopping carts and complete their purchases. they abandon your site - all in an effort to help them to complete their purchase. Cart Rocket's professional suite of retention and abandonment tools significantly increase the likelihood of every customer making a purchase. Each Cart Rocket tool is beautifully crafted and designed (for desktop, tablet, and mobile), and only activates if someone attempts to leave your website. Any customers who go through the normal checkout process will never even know that we exist. 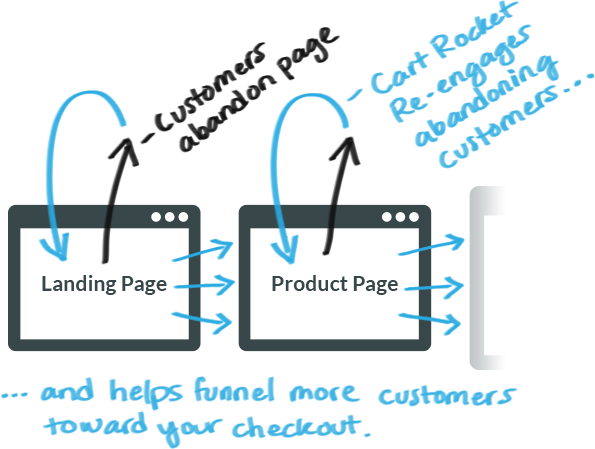 Cart Rocket has several options that help to re-engage visitors who try to abandon your landing pages and product pages; keeping more potential customers on your website, and helping them to progress toward your Shopping Cart and Checkout pages. 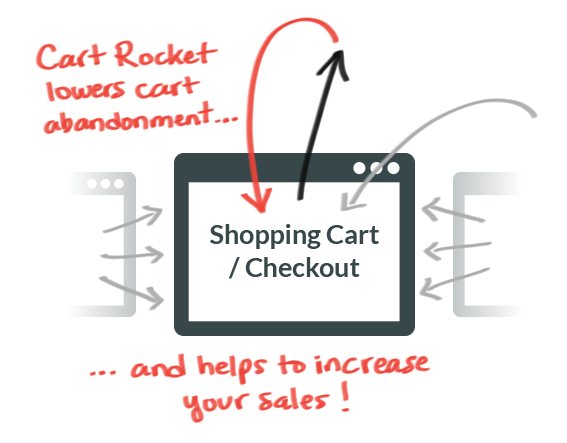 Cart Rocket's cart abandonment solution stops your customers from abandoning their shopping carts, and motivates them to successfully complete their purchase, which significantly lowers your cart abandonment rate and increases your overall sales. your customers who've already left. Just because a customer abandons your site doesn't mean that they're gone forever. 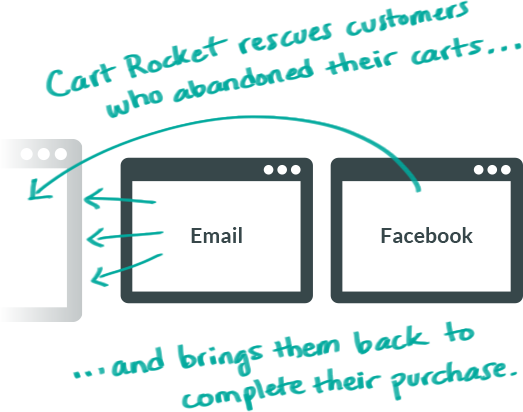 Cart Rocket helps to rescue your abandoned customers via email and Facebook; bringing many of them back to their shopping cart to complete their original purchase. all the difference to your success. As a Cart Rocket client, the same Inc. 500 executive team that built our sister company, Shopper Approved, into one of the fastest growing companies in America, will be working directly for you and your business, helping you to lower your cart abandonment and improve your company's sales. As a client, not only do you have your own Dedicated Account Manager to help you setup, strategize, and manage your campaigns for you, but all of your designs are hand-crafted by our Graphic Design Team to perfectly match your website. Finally, any custom programming or integration needs are performed by our Senior Programming Team.